The dried beans I used to make the soupy, Mexican-restaurant-style ones described below were from an Iowa heirloom bean grower/vendor called Seed Savers Exchange. I’d had a Rancho Gordo sample box on my Christmas list for a couple years now, but apparently nobody took that request seriously, so I decided to buy them for myself. After doing a bit of research, however, I found Seed Savers Exchange, for which I opted over Rancho Gordo because it’s nearer to Minnesota and has a comparable (or maybe even greater) selection of heirloom beans. I bought about ten pounds of various beans. They arrived within two days of ordering online and they are all beautiful and unique. I’d been working through them slowly until I read recently that beans should be used within a year of harvest, and that’s galvanized more bean-making in our home lately. I shouldn’t need an expiration date to motivate me, though. I love beans, and they are so simple to make, and you can do so many things with them. 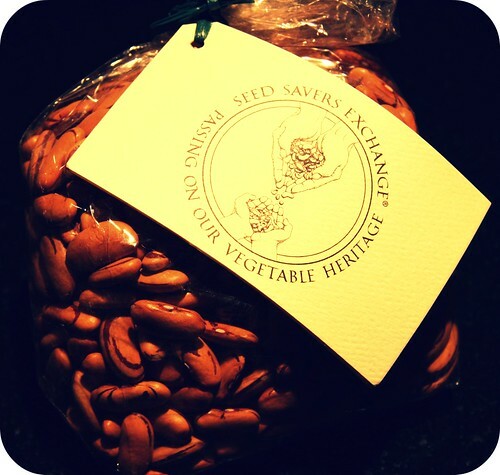 My experience with Seed Savers Exchange was awesome, so if you are interested in ordering heirloom beans, I highly recommend the company. 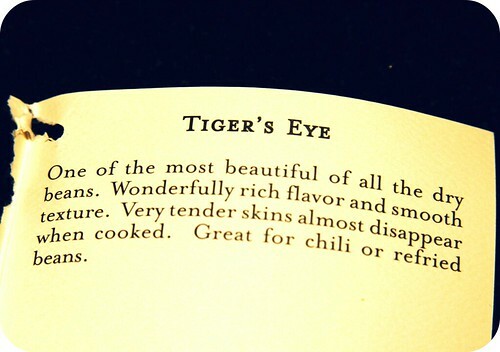 I used Tiger’s Eye beans, which are beautiful when dry. When cooked, they look and taste like oversized, creamy pinto beans. They were a good choice, if I do say so myself. The recipe I played with to make these beans is an Emeril recipe from Foodnetwork.com. Emeril mashes them and makes them “refried” style, and you can too, but I did not. In a medium, heavy pot or dutch oven, combine the beans, bay leaf, and enough broth to cover by about one inch (about 4 cups). Bring to a boil. Lower the heat and simmer uncovered, stirring occasionally, until the beans are very tender, about 1 1/2 to 2 hours, adding more broth or water as necessary to keep the beans always covered. When the beans are soft, remove pot from heat. In a large, heavy skillet, melt the bacon drippings and butter (or whatever combination of fat you choose to use) over medium-high heat. Add the onions and cook, stirring occasionally, until soft, about 3 minutes. Add the garlic, spices, and salt, and, stirring constantly, cook until fragrant, about 1 minute. 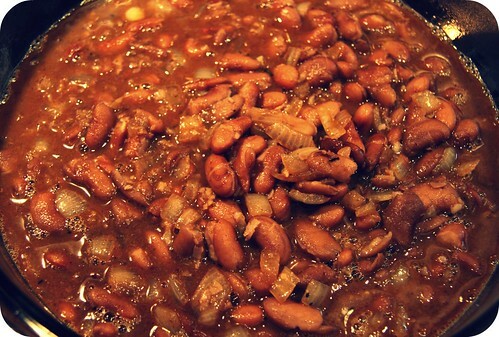 *A soaking shortcut is to cover the beans with water, bring to boil, boil for 2 minutes, turn off the burner, cover, and let them soak for 2 hours. Drain, rinse, and then start recipe. Preheat oven on broil setting. Spray or brush olive oil on both sides of each tortilla. Place tortillas on baking sheet and broil for 2 minutes on each side, until firm and toasty. In a nonstick skillet, cook your eggs however you like them best. Season with salt and pepper. 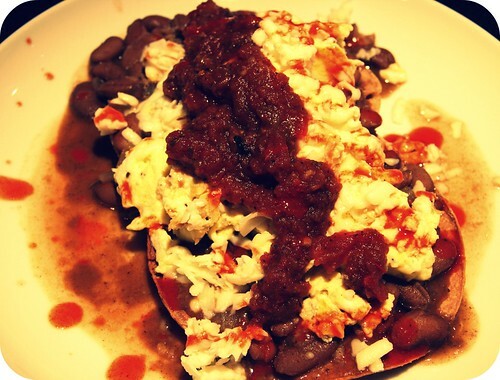 Reheat Mexican Whole Beans if necessary. When tortillas are done baking, place one egg on each tortilla and, using a slotted spoon, top with 1/4 cup whole beans, followed by 1/4 cup cheese. If you like your cheese melty, place under broiler again for another minute. Otherwise, top with fixings of your choice and dig in. had some tiger beans from the garden this year, and wasn't sure what to do with them other than pretend they were pintos and make refritos out of them. this was definitely a yum. You're welcome! I think I'm going to have to make these again soon myself. We've just used up our stash of beans and I'm ready to order more. Jealous of your garden. I forget that people can have beans from a garden!